In this third installment we have conducted an email interview with Cameron Adams of Fluent, a new workflow style email client. If you haven’t given the demo a try yet, do so here. Remy: How did the Fluent project get started? I know you guys are former Google engineers who have worked on the Wave project – did you already have some ideas for Fluent back then, or has it formed in more recent times? Cameron: Fluent got started, essentially, as soon as we left Google. We had some idea that we wanted to improve communications, but it took a few months of bouncing around thoughts before we felt like we’d nailed a good idea. Wave, of course, influenced our thinking and we’re keen to take learnings from it, but those lessons tend to be more in the vein of how to run a project, when to listen to users, and to always stay quick & nimble in execution. Remy: After the initial rush reported in your blog post here, are invite requests still pouring in? Cameron: Invite requests are still coming in. We’ve been trying to downplay much media attention, as we’re having trouble keeping up with the demand for invitations. The plan is to consolidate our service, get it ready for a big number of users and then do a more concerted public push. Remy: In another blog post, you have formulated a vision with one big point: Communicating in the best way possible. Can you elaborate on future plans in terms of other channels (chat, voice, text and such) maybe being integrated, or some form of social media integration like Inbox2 (http://www.inbox2.com/) has? Cameron: We still think that email is a great way to communicate but of course there are many avenues in which we can communicate in the modern world. SMS, Twitter, Facebook, IM; they all contribute to how we talk to people and where it makes sense we would like to integrate those channels into Fluent. We also want to make communication more than just typing into a text box. Collaborating on documents, annotating images, sharing files: they’re all things that contribute to how you interact with other people, and we think that communication tools don’t do a good job of integrating them at the moment. Remy: Are you guys heavy email users yourselves in the sense that Fluent solves your own email load as well, or don’t you handle that much email on an average day? Cameron: We’re definitely not as heavy users of email as some people we’ve seen, but while we want to make a product that *we* want to use we also use other people’s experience to help guide our decisions, so Fluent isn’t designed just for receiving one or two emails. It covers the full spectrum of email users. Since we went public I’ve had quite a few different email accounts to work with (media enquiries, account support & personal emails) and Fluent has certainly been a big help in handling all of those. Remy: In one of your latest blog posts you are talking about mobile email. As far as I can tell, it’s browser based mobile usage of http://fluent.io, not an app. Is that done on purpose or currently the best way to go for you and the team when it comes to mobile usage? Cameron: For the moment our mobile story is based in the browser, because we can utilise and adapt the code that we’ve already written for desktop browsers. We would love for this to be the way that we offer a great mobile experience for email, but we can foresee some hurdles that may force us to move to a native app platform. The main disadvantage with that is the time and resources it will take to develop a separate application. Remy: On several instances you call the way Fluent works ‘the future of email’. So far it seems the project is succesful and drawing a lot of attention. 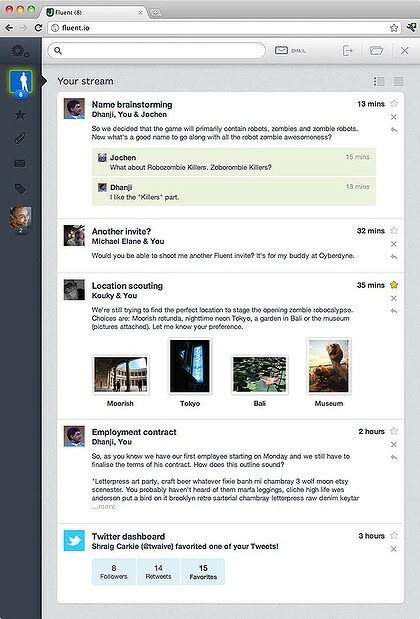 Do you think that, as Fluent gets picked up, other email clients will come to offer this timeline style of email messaging, like Outlook for instance? Cameron: It’s hard to say how Fluent will influence other email and communication applications. Of course if it’s a great success then people will be keen to emulate its behaviour but there’s also a certain inertia that keeps products like Outlook and Gmail from moving quickly. They already have a large and quite diverse user base who are used to the way that those products work, if they start changing things around and catering to more niche audiences they (Microsoft, Google, et al) run the risk of killing the golden calf. Remy: Is there a special render engine involved for rendering the emails when it comes to HTML/CSS? Like Webkit, Gecko or a ‘home-grown’ engine? Cameron: There’s no special rendering engine for the emails. We rely on the browser to do its thing. We *do* process and simplify the emails to make sure they display nicely inside Fluent, particularly in the stream, but otherwise there’s not too much magic. Remy: Are there any thoughts on offering corporations your Fluent service as a paid option, instead of their regular Outlook email / Yammer timeline traffic? Cameron: Offering a service for large enterprises is certainly one of the options that we could look at in the future. Several companies have approached us with interest in using it internally, but for the moment we’re focusing on our public service. Remy: How has the response been by the beta-testers so far: any cool quotes to share, efficiency gains off the chart, weird occurences happening? Cameron: Reaction from testers has been great. We hear people saying things like “I’m floored at what I’ve been able to do in just minutes of playing with Fluent” and “it’s a lot more effortless than traditional email”. We’re at the stage where we are keen to hear any and all sorts of feedback from of users and it’s been invaluable having them find bugs and tell us about the features they’d love to see inside the product. Remy: In closing, what would you like to tell the world of email users out there about the future of email? Cameron: The one thing I’d like to say to all the email users out there is that — contrary to media opinion — email is not dead. While social media has offered a new avenue for various forms of communication, email still excels at one-on-one and small group communication. There’s definitely things that could be improved, and that’s what we’re doing with Fluent, but email and email-like mediums will be with us for a very long time to come. Thanks to Cameron of the Fluent team for his cooperation in this email interview! Check out their website here, and you can follow them on Twitter here. Their blog can be found here.